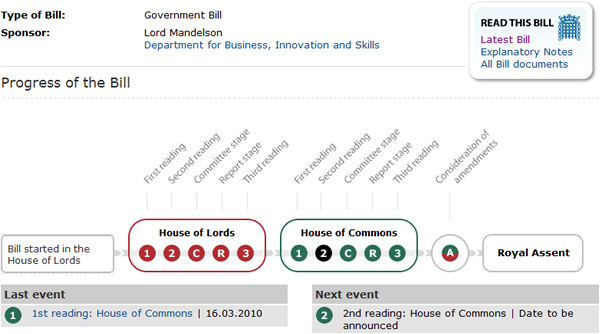 With the third reading of the Digital Economy Bill in the House of Lords, the Bill is now looking like a home run in its present form. With the third reading of the Digital Economy Bill in the House of Lords, the Bill is now looking like a home run in its present form. Whilst there has been widespread opposition to it from the public and the security services, it is likely to be passed with its most controversial elements intact. • The main political losers in this Bill seem to be the Liberal Democrats following Lord Davies’s amendments aimed at non-P2P file sharing. Despite the leading role of Lord Mandelson and strong Labour support for the bill – with the notable exception of former minister for digital engagement Tom Watson and Derek Wyatt – Clement Davies’s support and obvious connections to the media industry seem to have served as a political lightning rod. Lord Davies went against the views of the Lib Dem party faithful in his support of the bill and is likely to have cost them valuable votes in the forthcoming election. • Consumers are losers on a number of fronts – especially in terms of their rights. They can be fined, have their service curtailed or cut off for suspicious activity without a court injunction. What suspicious activity is likely to be is anybody’s guess. For instance a home worker or privacy conscious consumer using anonymous proxy services or VPNs may be considered to be suspicious activity, as could privately sharing a family video or self-created music content using P2P services which is how Kate Nash built her fan base. Consumer privacy will no longer exist as every packet of data going to or from their internet connection will be scanned using surveillance solutions such as Narus. This is the kind of technology which the North Korean and Iranian governments would love to have – assuming they don’t have it already. • Internet service providers will have to implement surveillance technologies in order to comply with the bill and have reporting obligations put on them. This will effectively put them in conflict with their customers – which is never a good place to be. • Record labels are going to be losers too. As businesses they desperately need to change their offerings and make themselves relevant once again. EMI is in a bad way and Warner Music’s share price is just over a fifth of what it was at the end of June 2006. The law fails to give them the incentive to develop new business models that would bring consumers back into the fold. Record companies fail to understand digital, where slow but steady sellers (what digital thinker Chris Anderson calls The Long Tail) are the way to make money. Instead the labels focus on mass-market hits; yesterday’s dropping of Jedward after one single rather than looking to develop artists is a case in point (not that Left Foot Forward are fans of the twins!). This trend has been going on since the CD golden age, since when the record industry has been aggressively culling rostered talent. • Law firms are the most obvious winners with new avenues opened up for them to pursue copyright revenues. Given that there is a lack of clarity over proof and data, behavioural marketing firms in the mold of Phorm could benefit from the raw data to target consumers. • Finally, companies could misuse the law for crisis and reputation management purposes. You missed one of the losers. MPs. Because I and others like me, who fought against the intrusion of Phorm and are now fighting against this Stasi-like legislation, will be voting AGAINST any MP who votes in favour of this Bill. I’m a Labour supporter and always have been but I will vote for someone else if my MP supports this Bill. The protection of my rights is the most important issue to me. Everything else comes second. Hi Josh, I would recommend that you let your MP know how you feel. 38 Degrees have a good tool which makes the process painless. Be sure to include your postal address including your postcode so they realise that you are in their constituency. Josh and Ged, I know there are a lot of critics of elements of the bill, however I simply ask, if not these measures, what? I think the internet and the World Wide Web are a very good thing, but the needs of consumers must be balanced against the needs of media industries such as the music industries. They are having a hard time at the moment, and so it is particularly important that we get tough on piracy and other siber crime.